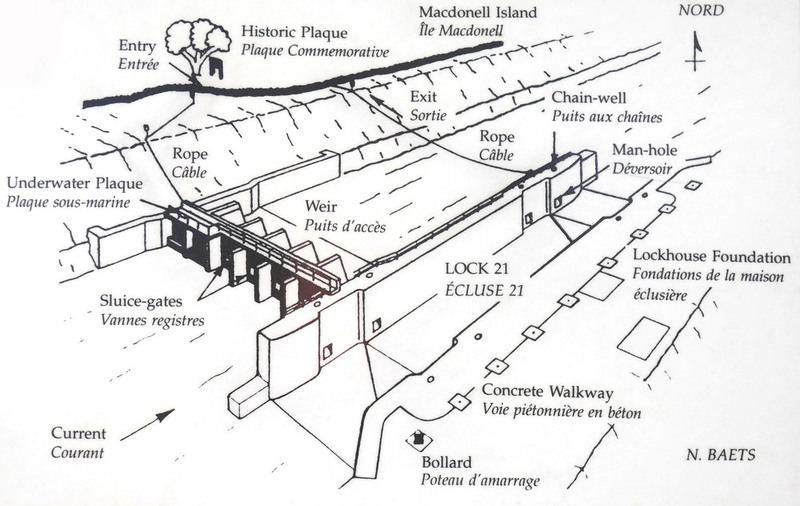 Lock 21, located off the southwestern end of Macdonell Island, is accessible by land from the Historic plaque. From Highway 401, follow exits to Ingleside or Long Sault to Highway 2. Enter the Long Sault Parkway (fee per car) to Macdonell Island. The Parkway's facilities are operated by the St. Lawrence Parks Commission. Picnic tables are on location and a snackbar, washroom, nature trail and camping facilities are only 4 km away on Woodlands Island. Guard Lock 21 is located at the upper entrance to the 11-mile long Cornwall Canal which was built to circumvent the great rapids of the Long Sault. It was constructed in 1885/86 as part of a second enlargement to the canal system and is 270 feet long between the gates, 45 feet wide and has 14 feet clearance over the sill. The Department of Railways and Canals operated the lock until 1936 after which the Department of Transport took over when the area was flooded to serve as headwater for the Hydro dam at Cornwall. The best way to start this dive is by snorkelling against the current to reach the buoy (100 ft from shore). A rope is tied to this buoy and will lead you to the upper structure of the lock in around 30 ft of water. This rope is sometimes covered by weeds due to the strong current transporting debris. Once on the walkway, the choice is yours on where to go. Going down upstream will let you admire the weir’s sluice-gates which are all closed except the most southern one where you can swim through. The Eastern side allows swimming along the lock wall. The challenge in this dive is mostly the force of the current. The current usually disappear once you are in the bottom of the lock but is present on the upper structure and in the unshielded area. The Lock 22 is part of the St. Lawrence Seaway and is actually a combination of locks built together into one structure. From highway 401, take exit 770 (Ingleside) and drive south onto highway 2 west along the St. Lawrence River. Turn left at the bird sanctuary entrance and take every left turn until the road leads you to a strip of asphalt that comes in and out of the river. This is the old highway 2 and the most western part of the lock stands approximately even with the Eastern end of the highway. This dive site is one of the best underwater orientation exercise you can do. This dive is also challenging on the physical aspect so be ready. Prepare a thorough dive plan because the numerous structure might confuse your orientation and lead you into trouble. Some ropes are present but could be hard to find because of the huge amount of weeds floating in the area. If you dive from Bord, head straight north into the small bay to return until you reach the 20 ft level out of the current, then head east towards the old highway. Use a compass to make sure you follow the right direction. Lock No. 23 is one of the many locks in the old waterway, which was operated until the flooding of the Thousand Islands area to make way for the Cornwall Dam watershed. It was nearly 4 miles long with at each end a lock (locks 23 and 24) with a difference of 10 and 8 feet, respectively. A second dredging work of this channel was started in 1884 and was completed in 1905. The new lock, 270 feet long, 45 feet wide, with a minimum of 14 feet of water, was built next to the old one, which was preserved and repaired for the passage of vessels pulling less than 9 feet of water. From the 401 take the County Rd-31 exit, EXIT 750, toward Morrisburg/Winchester and follow the directions to Morrisburg’s public boat launch. This is an advance Drift Dive and you should have peek air management skills under increased physical demands. The Mille Roches Power House is located in Lake St. Lawrence, West of Cornwall. It is accessible only by boat. Follow Highway 401 to approximately 11 km South of Cornwall and take the Moulinette Rd. exit (No. 778) to Long Sault. Turn East on Highway 2, direction Cornwall, and follow for 4.8 km until you reach Guindon Park. The park has an excellent (public) boat launch. During the season the powerhouse site should be identified with a buoy, located 0.5 nautical mile South (magnetic heading 183) from the tip of Guindon Park. The park also contains very good change and washroom facilities and picnic tables. The Mille Roches Power House was built for the St. Lawrence Power Company, founded by M.P. Davis and incorporated on May 23, 1901. It was located close to Cornwall Canal at Milles Roches and could generate up to 3,000 horsepower. Work began in the fall of 1900 and it was opened October 24, 1901. While the ownership changed hands several times, the plant stayed in operation until 1955 when it ceased to generate power. With the new Power Dam and Seaway nearing completion, a huge crane and ball were brought in and the building (brickwork) demolished in preparation of the inundation. The generators were removed, but two water turbines remain intact. The Lillie Parsons, located of Sparrow Island, is accessible only by boat. From highway 401, follow the signs to the Brockville Museum and down to the wharf. Sparrow Island is located upstream about three kilometres. The island's facilities are controlled by the Brockville Parks Department. There is no camping in the designated dive area, but picnic tables and outhouses are provided. There is a general use area with overnight camping (fee per tent), outhouses, picnic tables and firewood. The Lillie Parsons is a 19th Century Great Lakes Centreboard schooner. Built of white oak and rigged fore and aft, she is 131 feet long, with a 500 ton capacity in a 10 foot hold. She carried coal, lumber, wheat, barley, railroad iron and salt, and was sailed by a crew of six. She was launched on September 14, 1868 in Tonawanda, New York. On her last voyage, to Brockville, she hit a rock and took on water due to a cargo shift during a squall. She sank off Sparrow Island, August 5, 1877. The steamer Conestoga was built by Quale & Son of Cleveland for Anchor Line and launched July 6, 1878. A considerable amount of money, technical design and skill went into construction, as evidenced by the description in the Cleveland Daily Plain Dealer on July 8, 1878: “Fitted out in all proportions with a care to strength, durability and beauty… it is estimated that her cost will be near $90,000.00. Two hundred fifty-two feet long, sixteen feet deep with a gross tonnage of 1,226, the Conestoga was powered by a steeple compound engine capable of a speed of 8 knots. 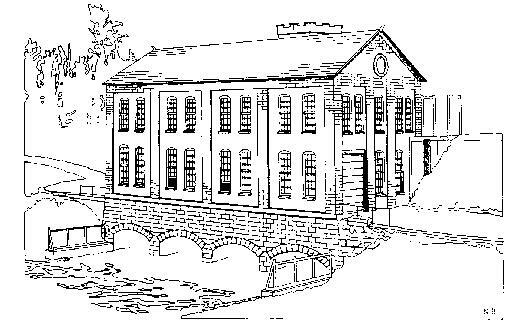 The upper portion of the steeple engine protrudes above the river, marking the site. She sank on May 22, 1922 outside Lock 28 of the Old Galop Canal, one mile east of Cardinal, Ontario. A fire broke out in the engine room while awaiting passage at the lock. The ship was flushed from the Lock and allowed to ground and sink in her present position. Loss was estimated at $200,000.00. She was carrying 30,000 bushels of wheat, much of which was salvaged. Take exit 730 from highway 401 and head South on Shanly Road straight past the Highway 2 intersection until you are in the parking lot of the Legion building. Take the tiny unpaved road west of the building which passes between a waterfront beach/park and a small canal. Park your car near the ship’s smokestack, which can be seen protruding from the surface about 50 feet (14 meters) from shore. 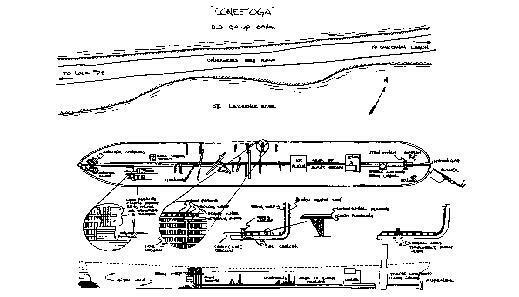 The Conestoga lies in the St. Lawrence River approximately 50 ft offshore with her bow pointing upstream. The bow lies in 20-25ft of water but inside the hull you’ll be at 10-15ft. Enter the water at least a hundred feet upstream from the stack as the current here is STRONG! Quickly kick out from shore and drop to the bottom. You should run straight into the bow (literally). After exploring the bow area in the sand, swim up over the bow and explore the windlass and huge anchor chain that lies curled here. Once inside the hull you’ll be shielded from the current and can drift effortlessly toward the stern. Explore the various items inside the hull including the huge boilers and stack. Over the stern you’ll find a beautiful propeller with one blade broken off (during an unsuccessful salvage attempt). The rudder lies flat on the sand just off the stern. Several passes can be made over the wreck during a single dive. The shallow depth and great visibility make this a bright, beautiful dive and there’s an endless assortment of things to see. The Rothesay, is located in the St. Lawrence River, west of Prescott. It is accessible both by land and by boat. Follow Highway 401 and take the Highway 18 Exit (#716) to Prescott. Turn west on King St. W (Highway 2) and follow for 1.75 Km until you reach Riverview Heights. There you will see a Historic Marker along the south side of the road commemorating Justus Sherwood. The adjoining grass strip can accommodate about a dozen cars. From the embankment you will see a buoy approximately 300 ft out, marking the actual wreck and a jug closer in that is the beginning of the line. 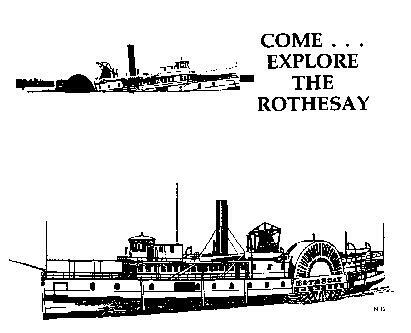 The Rothesay is a 19th Century wooden side wheeler (193' x 28.8' x 7.9') and was launched in St. John, N.B. on Feb. 2, 1868. Initially she sailed between Frederickton and St. John but was later relocated to serve on the St. Lawrence River. She was carrying passengers between Brockville and Montreal when, on Sept. 12, 1889, she collided with the tug Myra and sank at her present location. Although no-one was lost from the Rothesay two crewmen on the tug were killed. In 1901 members of the Royal Military College in Kingston blew up the wreck amidships in a munitions exercise. 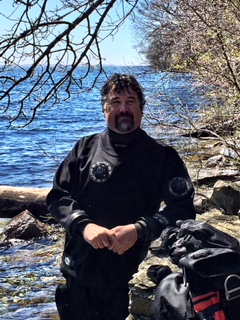 The Rothesay was rediscovered on Sept. 25, 1964 by the Underwater Society of Ottawa and remains a very popular dive site. 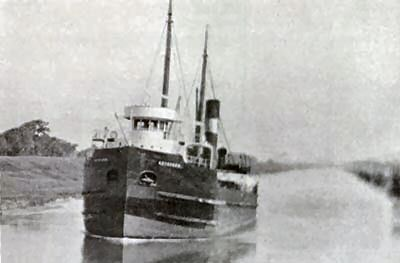 The wreck of the S.S. Keystorm is located in the St. Lawrence River in U.S. waters, 1 mile Northwest of Oak Island and can be reached by boat. Charters are recommended from either Browns Bay Provincial Park dock (near Mallorytown, Ontario on the 1000 Islands Parkway on Canadian side approximately 3 nautical miles Northwest of site) or from Brockville Marinas. The site is at N 44 25.8' Latitude, W 75 49.3' Longitude. A mooring buoy of coloured jugs is usually present. Parks, camping sites, motels are available in the Mallorytown area. Ref. Canadian Hydrographical Services chart #1418. The S.S. Keystorm was built in Great Britain in 1909-1910 for the Keystorm Transportation Co. in Montreal. She was a cargo steamer, 258 feet long with a 42.5 foot beam and a displacement of 2300 ton. She had two boilers and a triple expansion steam engine with 16", 26", and 44" diameter cylinders X 36" stroke placed aft. The after house contained the galley, crew's men, dining room and quarters for chief, oilers, firemen and second engineer. The rest of the crew including the captain's cabin were in the forward quarters. The pilot house was arranged particularly for canal service. On October 12, 1912 while bound from Ashlabula, Ohio to Montreal with a load of coal, she struck Scow Island shoal in fog near Alexandria Bay N.Y. The pumps were put in operation immediately but it became evident that the ship was doomed. Five hours later the Keystorm sank stern first and rolled over onto her starboard side going down. While her cargo of coal was salvaged, several attempts to raise the ship using steel pontoons failed. Formal hearings and investigation revealed that both Master and Mate were negligent in navigation and command of the vessel causing its loss. The Henry C. Daryaw was built in France in 1919. 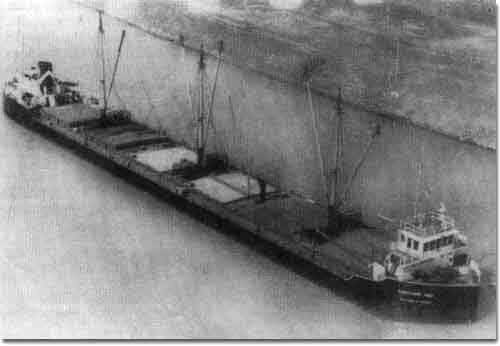 Originally a steel bulk freighter, it was converted to a bulk/package freighter in 1923. In November 1941, the Daryaw struck a shoal, which created a large breach on her starboard side. 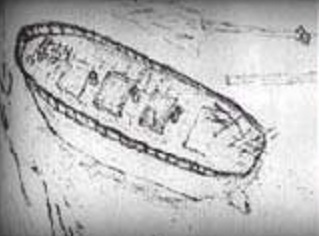 The ship eventually inverted and sank in between two shoals, resting at a depth of about 95 ft. Because the wreck is located in a section of the St. Lawrence river that narrows, the current is generally very strong. The wreck has a mooring line which requires divers to pull themselves down to the wreck. Once on the wreck, the current is minimal while underneath the wreck, however, around the outside, the current can pick up quite considerably. Much of the what can be seen is underneath the overturned wreck where it is sheltered from current. There are lines that allow divers to pull themselves along the starboard side of the wreck towards the bow. Once at the bow, divers can ascend to the top of the wreck and fly the keel (since the wreck is inverted). As you approach the stern, two large props and a rudder appear protruding from the wreck. Be sure to grab the line and pull back to avoid being swept into the shipping channel. The America came to a sudden end as a result of an accidental explosion in 1932, The ship sank in an overturned position near some shoals. The hazards include current in the channel, zebra mussels and, most importantly, oil on the ground everywhere around the wreck and under the wreck. Apparently, there was oil on board when the ship flipped and sunk and all that oil is now on the bottom covered by a thin layer of silt. Someone with poor buoyancy skills should stay well off the bottom. Built by the J.B. Auger & Co. from parts made in Scotland, and launched in 1871 at Montreal, the Kinghorn was named after the manager of the Montreal Transportation Company, located in Kingston, Ontario, since it was built from his design, this barge had an iron frame and wooden planking, the first of its type on the river. The Kinghorn had a capacity of about 20,000 bushels of grain. April 27, 1897, the tug Hiram A Walker under Captain Boyd had seven barges under tow in the American channel near Thousand Island Park. She was caught in a storm losing barges on the south shore and 2 barges at Johnston’s light opposite the park. With four barges left the Walker headed for Grenadier Island where the Captain of the Kinghorn reported his craft leaking badly. The Walker headed for Rockport with the injured barge however lost her 1/2 mile from Rockport in 90 ft. of water, where she was discovered in 1996 by Ronald MacDonald. This wreck has sometimes been confused with the fishing tug Edith Sewell, and the “Rockport wreck.” Located directly in front of the Customs Office at Rockport, this vessel sits in 90 ft. of water in the middle of the small boat shipping channel. This wreck presents an excellent technical dive training opportunity with everything from current to finding bottles. Starting one’s dive from the shore, it takes about 12 minutes to reach the wreck, and you still get approximately 20 minutes to play before reaching deco. If you take the full 20 minutes and swim right back to dock, deco drills can be preformed at 20′ and 15′ stops. This is a local favorite dive. The Kinghorn was a 130' barge that was carrying wheat in the 1890s she was a steel hulled with wood planking and is situated just a couple hundred yards from the dock in Rockport, this wreck was refound in 1995 and is the source of much debate, some no longer believe it is really the Kinghorn and thoughts weigh that her true identity is the "Edith Surwell". Well, at least it was until someone suggested the Surwell (or Cirtwell) was a fishing tug that has yet to be found, and that this particular wreck is the Sophia (which actually lies not far away). Who's to say until a positive piece of her identifies this shipwreck! Sitting upright in 88' this is an aging steel hull with no superstructure. It has several openings on the upper deck (one reportedly from an anchor dropped a little too close to the target) so there is a good deal of light penetration into the hold which can be explored easily provided you have good fining technique (if you don't you will be in the middle of a silt storm and other divers may finally have a use for the dive knives they have been carrying around for years). The upper deck is collapsing at a steady rate, and any penetration should be done with great caution if at all. Close to the down-line is a "Canadian" toilet, still in relatively good shape (this item which was clearly not original, has since been removed). Plates and cups are scattered around the upper deck and inside the hold on the stove, many having reportedly been "returned" (read: planted) here (so if you take one thinking you have a genuine artifact, you are most likely sadly mistaken but other divers will take the opportunity to laugh at you, and then turn you over to the local constabularies since removing items from Ontario wrecks is illegal). Don't miss the ship's wheel lying on its side on top of the stern, then you can find the windlass, bilge pump, stove and rudder assembly which make for a decent amount to see. The wheel is now devoid of all its wood, but a sizeable portion of the steering gear is still attached and reaches nearly to the bottom of the hull. A small stove what was once on the deck, then in the hold, now appears to be missing entirely. The A.E. Vickery was a wooden three masted schooner built in 1861 and launched in July of the same year. She sailed under the name of “J.B. Penfield” at Three Mile Bay, New York. She was renamed to A.E. Vickery in February 25th, 1884.The ship struck a rock while sailing near the American Narrows with 21,000 bushels of wheat on board. The shipment was destined to the Wisers Distillery in Prescott, Ontario. One story tells us that the night of the catastrophe, the captain Mr. John Massey was fearing the narrows and requested the pilot Mr. Henry Webber Jr. to sail the boat. At 10:15PM, the A.E. Vickery struck a rock and was quickly taking water. The captain dashed to his cabin and came back with a pistol to get an explanation from Mr. Webber about this accident. Fortunately, one of the crew member (also the captain’s brother), knocked the pistol overboard. The crew abandoned ship and found refuge in the nearby lighthouse near Rock Island. She finally disappeared below the surface at 2:00AM. The closest boat launch to this wreck in Ontario would be at the Rockport Government Docks. Head West passing between Bold Castle and Alexandria Bay in New York and head for the Ivy Lea International Bridge. The wreck is in US waters about 2 km’s West of the Ivy Lea International bridge. The wreck’s marker can be seen sandwiched by an island that houses an elderly couple’s cottage on the South side (immediately West of the light house on Rock Island) and a green buoy marked number 215 on the North side. The bow of the Vickery lies about 10-15 ft. away at a depth of 65 feet. Brockville Underwater Sculpture Park is the World’s Best Fresh Water Scuba Diving, offering a world-famous destination where divers enjoy clear water, an absence of thermocline, and the opportunity to explore shipwrecks, artifacts, and statues along the river bed. Seasonal passes are just $10, which makes it easy for divers to return again and again to see the wonders of The Sculpture Park and shipwrecks including H.P. Bigelow, John B. King, Fleur Marie, and the Rothesay. The Eastcliffe Hall was a steel freighter of 3 335 tons. She was carrying “pig iron” and met her destiny when she struck a shoal near Chrysler Shoal at 4:00AM. She sank in a few minutes and claimed 9 lives out of the 21 persons aboard. She rests in the shipping channel and became a navigational hazard. Her superstructure has been dynamited in order to clear the way. The best place to reach the wreck is to launch your boat from the Chrysler Beach & Marina. The wreck is at about 1500 ft west of the concrete cylinder-shaped abutment crowned with a green tower numbered 73. This tower is visible from the marina. Usually, two jugs are attached to the wreck, one at the stern (east side) and the other one near the bow. There is the presence of a strong current along the descent line but it disappears once you reach the wreck’s deck. You will be shielded from it in the hull. Precautions must be taken to ensure a safe dive over this wreck because sharp pieces of metal lies scattered around the wreck due to the explosion. Her cargo of metal bars rests on the bottom and are an artificial home for fishes. Bring a light because some area of the ship are shielded from the sunlight. Penetration is possible but should be performed by experienced divers only. The Fred Mercur was destroyed by a fire in her current resting place near Stanley Island. The entire crew was saved by a cottager with his… rowboat. Apparently the wreck survived quite well to her damages because she’s holding together pretty well. The stern is in 5 ft of water when the bow lies in around 45 ft. A larger piece of the wreck, detached from the main structure is resting at 30 ft from the propeller. The wreck is usually indicated by a jug floating on the surface, 2000 ft from the highway in a small bay. Beware of the wreck’s bow that might be only 5 ft below the surface when approaching her and be a hazard for your boat. The current is strong and the visibility is not good. Bring a light and use the wreck to shield yourself from the current. Pay attention to details and you can spot marine life like fresh water eels in the various holes surrounding the wreck. The most serious accident of the 1974 Great Lakes navigation season occurred in the early morning hours of Thursday, November 22nd, and has cost the Algoma Central Railway the services of one of its modern self-unloading bulk carriers. The vessel involved was the 619-foot ROY A. JODREY, built in 1965 by Collingwood Shipyards Ltd. The motor vessel was upbound with iron ore pellets for Detroit when, just after midnight, she struck buoy No. 194 in the St. Lawrence River near Wellesley Island in the Alexandria Bay area. 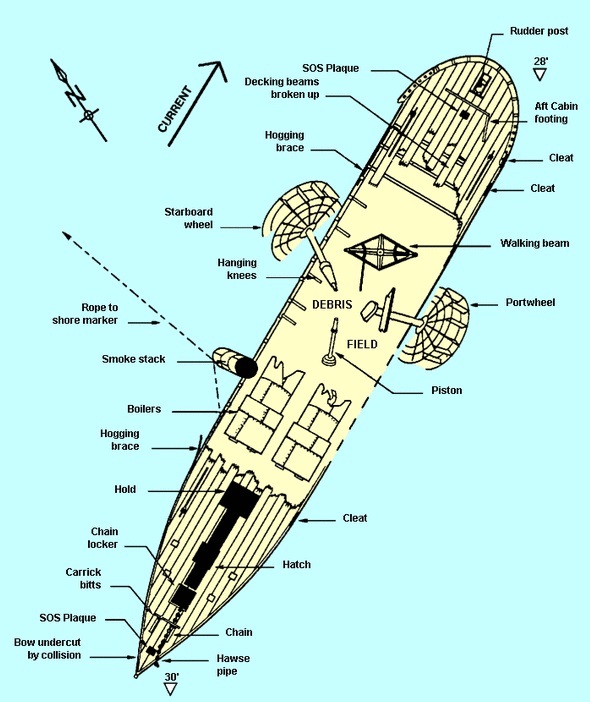 At the time of this writing, it appears that the buoy ripped a gash in the JODREY's hull plating and that the crew attempted to beach the ship to prevent her sinking. Nevertheless, the ship filled and rolled over onto her side. She then began to slip back off the rocky ledge on which she was resting and at about 3:09 a.m. she disappeared from view, sinking in the navigation channel which is at that point about two hundred feet deep. The Seaway was immediately closed to traffic but was reopened less than 24 hours later when it had been ascertained that there was a safe depth of water over the wreck which is lying in close proximity to the Alexandria Bay station of the U. S. Coast Guard. All twenty-nine crewmen, including Capt. Hugh McDowall of St. Catharine's, managed to reach shore safely before the ship sank. It is not yet known why the JODREY struck the buoy as weather conditions were far from unfavourable at the time. It is extremely unlikely that any attempt will be made to salvage either vessel or cargo. Originally a three masted wooden barque she was launched at Kingston, Ontario on April 21, 1863 as a 132.6 ft. x 26.3 ft. x 11.3 ft. with a cargo capacity of 20,000 bushels. In 1889 the Gaskin was being used as a salvage barge to help salvage the railroad ferry Armstrong that had sunk. During this process the Gaskin had been sunk three times, with the third time being the final time. A large anchor is located off the bow towards shore about 40 ft. from the Gaskin and adds to the site. The Robert Gaskin sits a half mile downstream from the Brockville waterfront and river focal point, "Blockhouse Island" and lies perpendicular to the current at a 55 ft. depth at the bow, and 70 ft. at the stern which sticks out towards the channel and shipping lane. The upstream shipping channel is very close to the stern and caution is advised. The Robert Gaskin lies about 700 meters off Brockvilles' centennial park. It would normally be considered a boat dive but can be a shore dive. Navigation skills should be sharp and a close eye kept on your timing device. There are lines leading out to the wreck, but they can be confusing because there are several and they cross each other near the shore. Swimming at a reasonable pace will bring you to the wreck of the Robert Gaskin in about 15 minutes, and by staying near a depth of 15 feet on the way out to conserve air, should leave you time to take a good tour of the wreck. Watch your air supply, there can be heavy boat traffic between the shore and the Gaskin so best to not have to surface. The park is a handy place to setup and we usually setup a table and place a tarp on the ground. The local folks are friendly and often curious. We try not to leave anything of much value lying around during the dive, though I have never heard of any divers losing any stuff here. There are public washrooms. There is a Tim Hortons on the way out of the town. Depending on the time of day you are setting up there can be a lot of locals using the entrance to the water, or none. Early is better. Looking toward the site, you can often see boats moored and divers entering the water. With good timing you should not have to look through their silt, time your dive so the other divers will be ascending as you are arriving. The current is strong, especially on the west side of the Gaskin. There is not much to see there anyway. Stay down current. After diving here for a few years we may be taking things for granted. I need to emphasize that as a shore dive it is dangerous. Boats generally pass by between the shore and the wreck at high speed, sailboats are quiet, fast and with their deep keel or center board just as deadly as a motor boat, maybe even more because you won't hear it coming. Dive flags are often ignored and a diver who has to surface quickly is on a highway. Evaluate your skills and options carefully! Morrison’s Quarry is located off of Highway 105 in Wakefield, Quebec. It is one of the region’s most popular scuba training sites. The greenish blue water of the Quarry reaches a maximum depth of 139 ft with visibility of about 25 ft in the summer to over 100 ft in the spring and fall. There are 2 distinct thermoclines that brings the temperature to 4-5 degrees at the bottom, no matter how hot it is outside. Winding downwards along the perimeter is the old access road, acting like gigantic steps that spiral down to the bottom. There is a plane at 35′ and a tugboat at 60′ both purposely scuttled to provide interest for divers. There are also two cars — one driven over the edge during the shooting of a movie action sequence, and the other driven over the edge by some bone-head car thieves. There is a fee of $10 payable to Mrs. Morrison or one of her sons upon arrival. A dive site liability registration form must be signed at time of payment. The Sir Robert Peel was a side wheel passenger steamer built at Brockville, Ontario in 1837. It was dark and rainy in Alexandria Bay, NY, on the night of May 30, 1838. The Canadian steamer Sir Robert Peel, under the command of John B. Armstrong, was taking on wood at McDonnell’s Wharf, in the southern channel of the St. Lawrence River just above Alexandria Bay. The Sir Robert Peel was on her way from Brockville to Toronto with nineteen passengers and 20,000 Pound Sterling, payroll for the troops in the Upper Province. A company of men, allegedly led by the infamous pirate “Captain Bill Johnston, ” rushed on board, shouting “Remember the Caroline.” They were disguised as savages and armed with muskets and bayonets. The passengers and crew were ordered ashore as the ship was set afire and pushed out into the river. The sunken hull remains there today, a popular attraction for scuba diving tourists and history buffs. Heavy rewards were offered for the apprehension of the culprits by both the Canadian and US governments. Johnston supposedly hid in a cave on the small island called “Devil’s Oven,” but was eventually captured. On the 2nd day of June, Johnston was indicted and held for arson in the first degree. He was tried before Circuit Court Judge John P. Cushman, and defended by Calvin McKnight, Benjamin Wright, John Clark and Bernard Bagley. After a deliberation of two hours the jury brought in a verdict of “not guilty.” Twelve others were ultimately arrested and held in the Watertown jail for nearly six months before they were released on their own recognizance. They were never subjected to a trial. The Sir Robert Peel is located just upstream from the 1000 Islands Bridge. It sits in 120-135 feet of water with the boiler sitting in about 80 ft. of water. 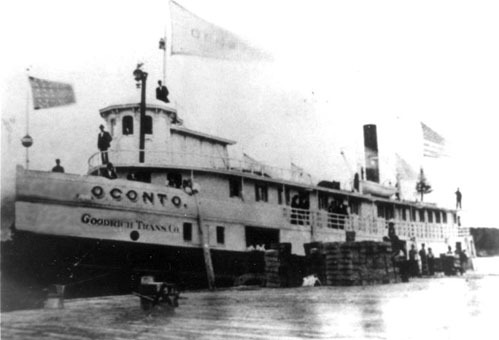 The steamer Oconto was on her first trip carrying a cargo of silks, cotton, boots and 15 passengers. She struck Granite State shoal in July of 1886. There was an unsuccessful salvage attempt and the Oconto slide down the steep side of the channel and eventually broke in two.